This is an immediate action alert on an important pro-gun bill that will be introduced in committee next Monday morning (January 29th)! Your hard work has paid off, and we are finally getting a “print hearing” for the Stand-Your-Ground bill you have been fighting for since the session started. Your help is still needed to get it to a full public hearing — more on that in a second. The hearing on Monday is a big step for Stand-Your-Ground in Idaho. Chairman Loertscher, who heads the House State Affairs Committee, agreed to let the bill be presented before his committee. It is news the gun grabbers aren’t going to like. They are already getting nervous that better self-defense laws are one step closer to passage in Idaho. Make no mistake though, anti-gun zealots across the state are going to come out of the woodwork to try and urge the committee from voting for this bill and moving it to a full public hearing. The public hearing, which allows you to go and testify on the bill, is the next big step. That’s where gun owners would be able to come and voice their support for Stand-Your-Ground in Idaho. What do we need to get the bill to a full public hearing? There are 15 members of the House State Affairs Committee, and that means we need 8 of the committee members to vote yes! The committee is made up of 13 Republicans and 2 Democrats, but we expect the vote could be much closer than some anticipate. We expect some committee members are not going to like how strong we are trying to make Idaho’s self-defense laws, and are going to do all they can to tear the bill down. You need to be at that hearing to show your support! While public comment is not allowed at this hearing, we need to pack the room with gun owners. You can track detailed information about the hearing using our Facebook link here! But before the hearing, you need to make your voice heard right away! The House State Affairs Committee must know that you support Rep. Christy Zito’s Stand-Your-Ground legislation, and you want it to move forward as it is currently written! First, we have pre-written an email for you. By clicking on the link below, you can send the entire committee your pre-written email which urges them to vote yes and move the bill forward for a public hearing. We don’t have much time, and your voice is crucial to helping the committee understand the importance of this bill to gun owners. Finally, in order to help us move this alert out to more gun owners across Idaho, please chip in $50 or $25 right away! Time is running out. Act now for your gun rights. The first step of moving Stand-Your-Ground forward in Idaho is here! 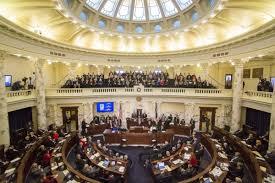 The House State Affairs Committee will meet on Monday to vote on whether or not to hold a full public hearing on the Stand-Your-Ground bill sponsored by Rep. Christy Zito. Use the link in the main body of the email to send the entire committee a pre-written email that urges them to vote “yes” for a full public hearing. We have also provided their phone numbers and Facebook page links to contact them in addition to your email. Finally, we need to reach as many gun owners as we can with this alert. So please consider a small donation of $50 or $25 to help us mobilize gun owners right away! Stand-Your-Ground Hearing Tomorrow! Week 3 Session Video Recap!